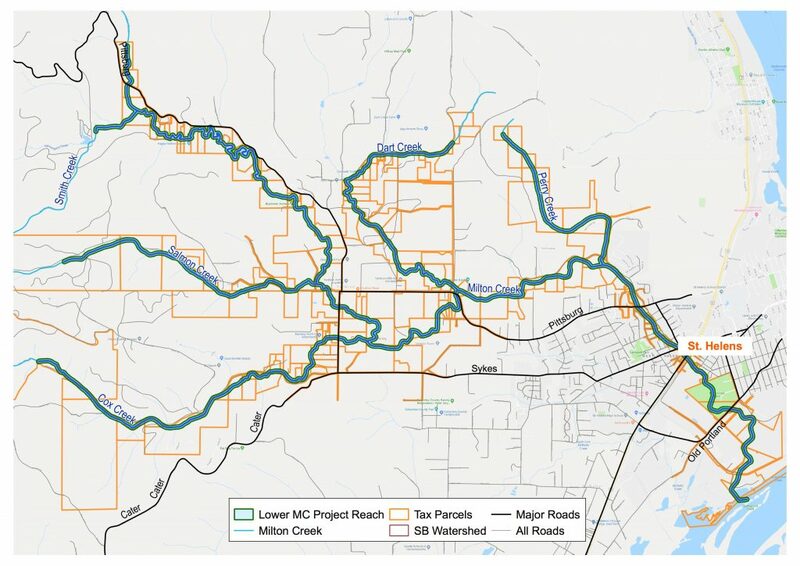 The project goal is to detail current riparian corridor conditions and identify restoration actions that can effectively address resource concerns. This includes prioritizing projects to maximize limited resources, and working with landowners to educate them on conditions and potential restoration methods. Lower Milton Creek is defined as that reach of the creek from its mouth at Scappoose Bay, upstream approximately 12 miles, to approximately one-half mile above the Smith Creek tributary. This area is downstream of industrial timber properties, where rural residential and urban properties are the major land use. This also includes most reaches of Perry, Dart, Cox, Salmon and Smith Creeks. The main distinction is property use – industrial timber (upper Milton) vs rural residential and urban (lower Milton Creek). Landowners along this section of Lower Milton Creek were invited (by mail) to attend an informational meeting on potential restoration activities on Thursday, November 29, 2018 from 6:00-8:00 pm at the Columbia Soil & Water Conservation District office. For more details see Landowner Meeting Notes (138KB PDF).